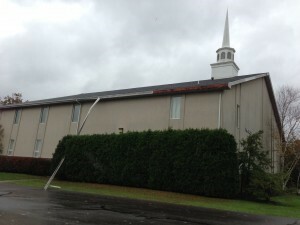 The Telford campus of the Penn Valley Multi-Site Network in Pennsylvania sustained some damage to their building as a result of the storm. Here are more reports from Grace Brethren congregations who were in the path of the superstorm, formerly known as Hurricane Sandy, which came ashore last evening near Atlantic City, N.J.
“We have come through with no damage just alot of rain. Appreciate your prayers God was gracious to us in Southern Maryland.” Pastor Carl Snyder, Grace Chapel Ministries, Mechanicsville, Md. “Many of our church family are without power and have some damage but overall – as far as we know – we’re in good shape compared to the Jersey Shore and NYC. … The Telford Campus is cancelling our Trunk or Treat event slated for tomorrow night.” Michelle Kane, Communications and Office Manager, Penn Valley Multi-Site Network, Telford, Pa.
“It’s over in our area and we made through with few problems – mostly wind, rain and power issues. Watching the storm slowly come up the East Coast made us tense at times especially Sunday and into Monday as the forecast kept worsening. It definitely caused me (many times) to remind myself of the greatness of God. The coastline of CT took a tremendous beating and incurred much damage, but inland (where we are) left only some without power and inconvenienced, but in the end, that was all.” Pastor Chris Skowronek, CenterPoint Community Church, Wethersfield, Conn.